Congratulations to everybody who is lucky enough to live in the eclipse path, or who made the effort to get under the shadow of the moon! I hope it was grand; I was on the wrong side of the planet this time, so I have had to enjoy it via the internet. 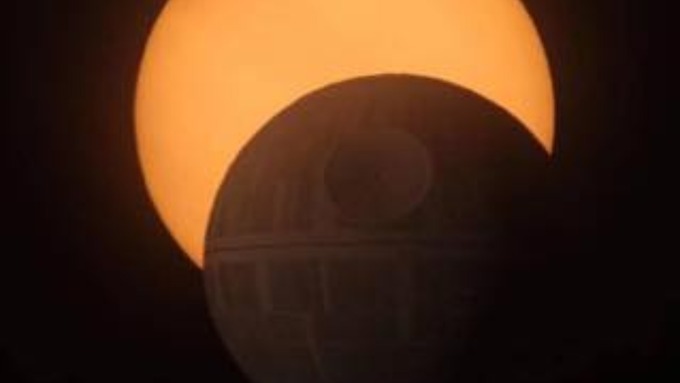 Of course, the Internet likes to have fun, so along with the various actual eclipse photos (which range from cool to spectacular), there have been some pictures replacing the black disk of the moon with the DeathStar. Long time readers of this blog will know that this Lounge has a great view of imaginary spacecraft in orbit; the Death Star fits into that category nicely. So with a bit of basic math and physics, we can calculate the conditions under which the Death Star can eclipse the sun, as viewed from here on Earth. But first, we need to define our Death Star. I won’t dig too far down into the seedy underbelly of Srat Wars fandom, but a oft repeated figure for the size of the Death Star is a diameter of 100 miles, which yields an 80km radius. As for the density (which we’ll need later for reasons I don’t want to spoil), we will go with 800kg/m3. This is the density of something that is 10% steel and 90% air, which would give it the same general construction as modern naval vessels. This makes the Death Star slightly more dence than pure ethanol, but substantially lighter than the beer which fuels this blog. In order to eclipse the sun, the Death Star needs to subtend a larger angle of sky than the Sun. For the sake of simplicity, we will call the sun angle 0.5 degrees, or 30 minutes of arc (it actually varies slightly, as the Earth’s orbit is elliptical, and the eccentricity of this orbit changes between 0 and 6 percent depending on where in the Milanković cycle we are). So, given a 80 km radius, the Death Star can eclipse the sun if it is closer than 80/sin(0.25deg)= ~18,300 km. This is much farther than near Earth orbit, but much closer than geosynchronous orbit (about 36,000 km altitude). It is also, of course, about 21 times closer than the Moon, which is about 21 times larger than the Death Star. However, it means that if the Death Star was in Geosynchronous orbit (to ‘hover’ over a target, for example), it would not eclipse the sun; it would block out at most a quarter of the light, which would be barely noticeable by people down below. On the other had, if the Death Star was in low Earth orbit, like the International Space Station, it could easily eclipse the Sun. An 80km radius space station only 360 km up would be huge from the point of view of an observer directly underneath, blotting out more than 25 degrees of arc in the sky as it zoomed past at 8 km/sec (or one diameter every 20 seconds). However, it isn’t clear if the Death Star could fly this close to our planet. The orbital velocity of a satellite around the Earth, in meters per second, is sqrt(GM/R), where G is the Gravitational Constant (6.67E-11 m3kg-1s-2), M is the mass of the Earth (6E24 kg), and R is the radius of the orbit IN METERS (not km). So with an orbital radius of 6700 km (329km above the mean surface), the orbital velocity is 7728 m/s. The problem for the Empire is that the Death Star has a radius of 80km, so the guys sitting in the gun turrets facing the Earth only have an orbital radius of 6620 km. Thus they will be orbiting at 7775 km/s, 47 m/s faster than the space station. For people who live in the real world, that’s a 105 miles per hour, or 165 km/hour difference. Smashing your troops against the walls at a hundered miles per hour is going to impede their ability to fire their super laser, and it is possible that even the structural integrity of the Death Star would be under threat this close to the Earth. Back here in Science Land, we call the closest that a satellite can get to a planet without being torn apart by this sort of differential orbital speed the Roche Limit. The Roche Limit determines the closest approach a satellite can orbit a planet without being torn apart. Technically, the Roche limit only applies to objects held together by gravity- e.g. with no tensile strength. Steel, the purported structural material of the Death Star, has substantial tensile strength- this is why it’s used for everything from bicycle spokes to suspension bridge cables. But even if the space station is held together by the tensile strength of the steel, that will be little comfort to everything and everyone that isn’t tied down; even if the Death Star could survive inside the Roche limit, the occupants wouldn’t. So in order to know if a fully operational Death Star can eclipse the sun, we need to calculate the Roche Limit, and determine whether it is closer or farther than the maximum eclipse distance of ~18,300 km calculated at the top of this blog post. R is the radius of the Primary, rhoM is the density of the primary, and rhom is the density of the moon. And the assumption we are using is that the density of the death star is 0.8 g/cc or 800 kg/m3 (a bit less than my second beer). As for the other numbers, the Earth’s radius is 6371km, and the earth’s density is 5500kg/m3. So the Roche limit for the Death Star is 15,263 km. This is closer than the maximum eclipse distance of 18,300 km (which is a distance, not a radius, so you can add up to 6371 more km for an equatorial eclipse viewer), so there is a range, albeit a fairly well restricted range, in the orbital radius of roughly 16,000 to 24,000 km where the Death Star is far enough from Earth to not be tidally disrupted, but still close enough to blot out the sun. But it wouldn’t be blotted out for very long. A 16000 radius orbit has an orbital velocity of 5 km/s. So even with an equatorial observer only 10,000 km away, where the shadow is largest, at 72 km wide, totality would last less than 15 seconds. This is almost the exact elapsed time from Tarkin’s “Fire when ready” to weapon discharge. And Bonnie Tyler wouldn’t even have time to get a little bit tired of listening to the sound of her tears. Can bad fashion save the icecaps? With rapid melting in the Arctic, and potential glacial instability in Antarctica. the planet’s present cryosphere is in a spot of bother. The root cause of this is warming from the heat trapped by greenhouse gasses, mostly CO2. But while many suggestions have been made for reducing CO2 output, as yet there are relatively few mothods for capturing those emissions which are still occurring. And with international agreements lacking enforcement mechanisms, a new push for Coal in the US, and decades of record rates of emissions growths, humanity clearly needs someone to police the worlds emissions. And we don’t need any old police. We need fashion police. Although many proposals have been made for finding ways to prevent our hunger for fossil fuels from ruining the atmosphere, not nearly enough of these strategies have included the use of tacky clothing. And yet, the potential for horrific fashion statements to save the world should not be underestimated. The reason for this is that ultimately, the easiest way to scrub carbon dioxide from the atmosphere is to react it with an alkali or alkali earth oxide, thereby forming a carbonate mineral. While silicate weathering will do this naturally over a 50-100kA timescale, we can’t really afford to wait that long. Roasting carbonates obviously won’t accomplish anything, since that simply makes the alkali oxides available by releasing CO2. However, there are alternatives. One way to generate an effective carbon dioxide scrubber is to split salt (from ocean water) into its component sodium and chlorine. The sodium will rapidly (on a geologic timescale) oxidize, hydrate, and carbonate, forming NaHCO3. This should be reasonably effective, so long as we can sequester the chlorine that is produced as a byproduct. And here is where the tacky clothes come in. During the latter part of the 20th century, outrageous costumes were constructed out of the polymer polyvinyl chloride. If we can simply manufacture enough disco pats, fake leather jackets, and not-so-Sunday dresses, that will sequester the chlorine from salt electrolysis in the world’s wardrobes, so that the sodium can be used for atmospheric CO2 drawdown. Doing a bit of math here, with annual emissions of about 29 billion tons of CO2, we will need about 15 billion tons of Na to scrub our emissions. This requires approximately 55 billion tons of PVC to store the chlorine left over from the salt decomposition (powering the electrolysis is left as an exercise for the reader). Luckily, due to the large world population, this works out to only about 8 tons of PVC per person per year, or about 21 kg of PVC per day. None of the PVC outfits I can find for sale on the internet at this hour appear to contain 21 kg of material. They are generally a little bit flimsier than that. And even with a new steampunk, burlesque, gothic, and disco outfit every day for every man, woman, and child on Earth, we are still looking to be short by a factor of 50. Buying 21 kg of new PVC outfits a day would necessitate a costume change every 7 minutes. Luckily, there are other things which PVC can be made into. For example, the credit cards used to purchase PVC outfits by people too brazen to stoop to cash are made of PVC. And while they only weigh a few grams each, most people do have a few. Similarly, the music to which PVC clad people traditionally dance comes from an archaic form of grooved PVC platter known as a “record”. Buying 140 LP records a day will put all of the world’s citizens at their PVC quota without having to wear anything at all. So fear not, reader. There is hope. with enough old time music and garish clothing, anything is possible. The mantle which exists beneath the crust? In which trace elements must earn our trust. The elements closed min’rals don’t excrete. They will remember stories to expound. It could collect wherever dreams may fade. That which from asteroids to Earth came down. That specks of heaven settle everywhere. So, last year I published a Geology paper. It is summarized in Geosonnet 42; see link therein to the paper itself. As it turns out, the paper deals with Archean uranium mobilization and the sedimentary history of carbonado diamond. But what the paper doesn’t say is that I wasn’t actually trying to do that. More professional researchers than I might know how state in their articles that it was all just a lucky coincidence, but I don’t know how to squeeze that into a short format journal. What actually happened is that the second author and I realized that we had different pieces of the puzzle which, with the help of some old Japanese data, could be pieced together for a coherent story. So hey, "write it up." Most of my part of the puzzle was unpublished bits and pieces from my PhD and post doc 15+ years ago, but the SHRIMP data was actually less than a year old, as I had collected it for an entirely different reason. Back when I was working at ASI, which had just bought the Resolution laser ablation line from Resonetics, a few of us started looking at how the SHRIMP and laser products could best compliment each other. One of the things we experimented with was controlling the SHRIMP with a version of the laser control software. Another thing we wanted to know was whether there was any advantage to using the SHRIMP for detrital zircon provenance studies, so I pulled out my old PhD zircons, remounted them with modern standards, and we programmed a customized version of GEOSTAR to automatically rerun the same zircons (if they hadn’t been blown up) to compare the results. Of course, the laser data was old, and the SHRIMP was trying to make analyses next to laser holes (which distort the extraction field, due to the unfortunate tendency of holes not to be flat), but it generally worked, and the data is tucked away deep in the supplementary section of the paper. Since there are analytical geochemists who occasionally read this blog, but might not think to look for microbeam comparisons in the appendix of a diamond radiation defect luminescence paper, I thought I’d mention it, and put up some plots that got culled due to space requirements. The short answer is that fully metamict zircons (like half of the Tombador grains) are open system with either technique, but for zircons that are only a little bit metamict (most of the Jacobina zircons), the smaller ion probe spot and better 204Pb backgrounds improve data quality. Anyone who is interested is welcome to download the Data Repository data (it’s all there) and ask. Figure 1 (See data repository for full version): Tombador zircon analyses with SHRIMP (red) and laser ICPMS (yellow). The SHRIMP data are, in general, a little more concordant, but there isn’t much in it. Figure 2 (See data repository for full version): Jacobina zircon analyses with SHRIMP (red) and laser ICPMS (yellow). For this sample, the SHRIMP data are substantially more concordant. Figure 3: Probability distribution curves for Tombador zircons analysed by SHRIMP (purple) and laser (Red). Figure 4: Probability distribution curves for Jacobina zircons analysed by SHRIMP (tan) and laser (Red). Note that laser peaks are generally broader and offset to younger ages due to Phanerozoic Pb loss. Did not have apples, naked girls, delights. clay seems more likely, or serpentinites. at understanding help if we know speed. Contains trace actinides which will decay. Gives cooling time and late stage growth away. The final Greek tectonic stretch began.